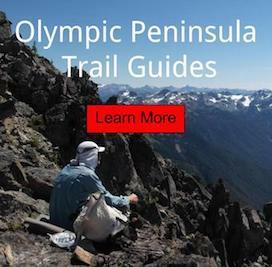 Join two hikers, as they spend seven days backpacking across the Olympic National Park. Our main goal was to hike from one end of the Park to the other, but being so familiar with the Olympic Mountains, I decided it would be best to do several detours; so that my friend could experience lessly known places on the Peninsula. For this adventure, I'd be accompanied by the founder of Locus Gear from Japan. His company has designed the tent I use for the last few hiking seasons. He flew to Washington State to experience the Olympic Mountains for himself and would not leave disappointed. The basic logistics would have us walking from Dosewallips road to Quinault Rainforest. I had a friend drop us off at the trailhead to start our trip and then we would use public transportation to finish this grand adventure. Come along on our seven day backpacking trip, told through photography and video. The plan was to ascend a few 100' off the trail and use a mountaineering shortcut to get us to our next destination. It proved to be too dangerous, so I suggested we turn back around and use the trail. This made for a very long day to our next campsite. Day 7: Trailhead at the other end of the Olympic Mountains. Road walk, hitch and bus still left to end this adventure. Note: minimalist footwear wore and dirty feet. Disclaimer: Altho brands are mentioned in this article. I was not compensated in any way for my affiliation with this company. Article does contain ads in the form of affiliate links.